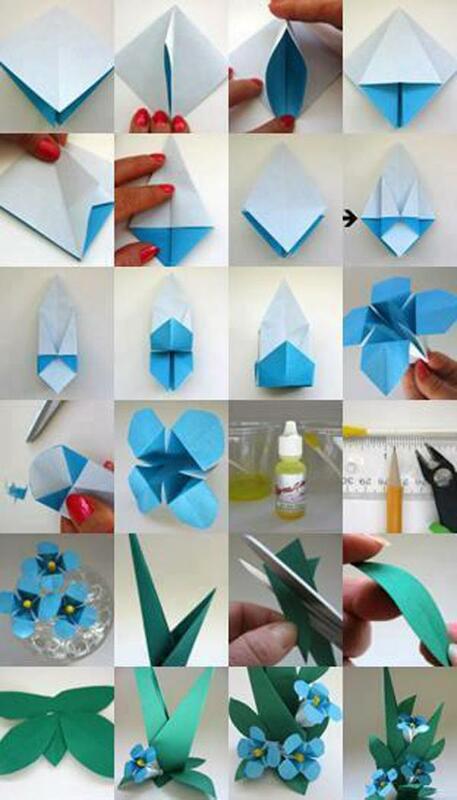 Everybody knows about origami, the Japanese art of paper folding. 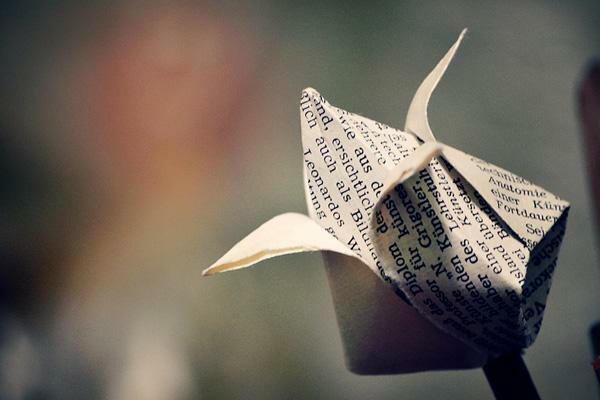 But what is it that can make origami so magical, so engaging and so deeply touching? 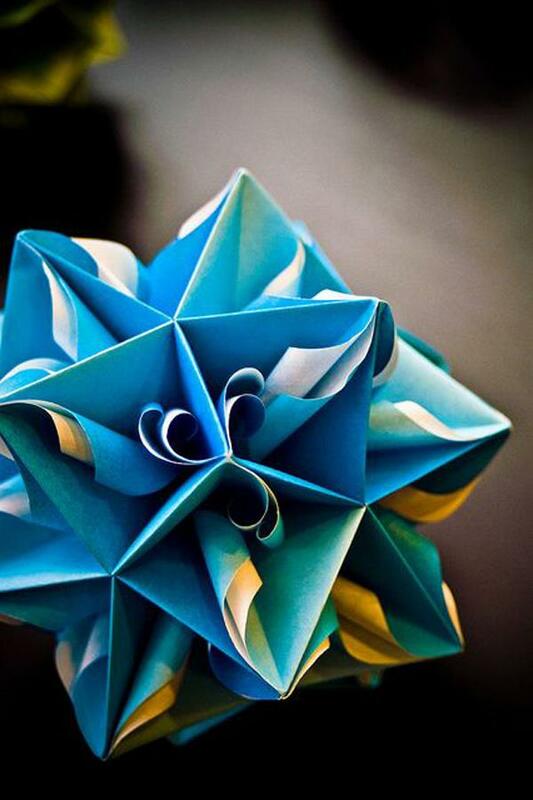 The name of origami is made of Japanese terms oru, which means “to fold”, and kami, meaning “paper”. The art of paper folding, therefore has a very bountiful history spreading across the Japanese culture, social system and all islands. Having been invented in China at the very beginning of the second century AD, paper entered Japan four centuries later, brought to the country by monks. 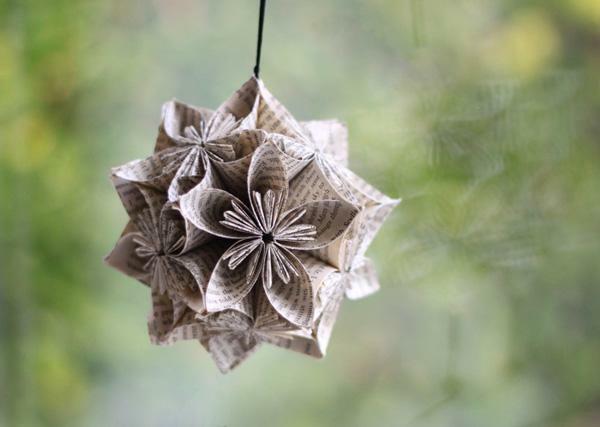 Handmade and rare, paper was a luxurious commodity, available only to the richest. 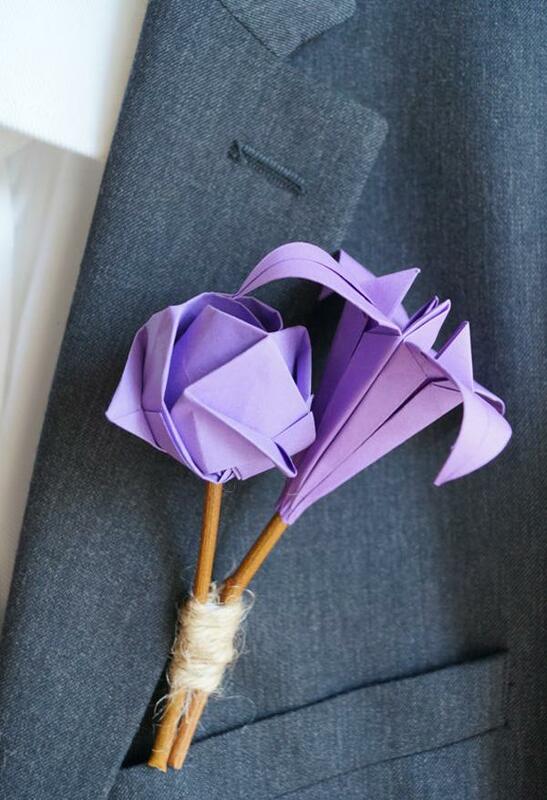 Therefore, origami was intended to be used during religious ceremonies only at first. Origami was developing greatly over centuries and when Edo period began with the sixteen hundreds, it has already become a leisure activity, although it kept the ceremonial purpose it originally had. 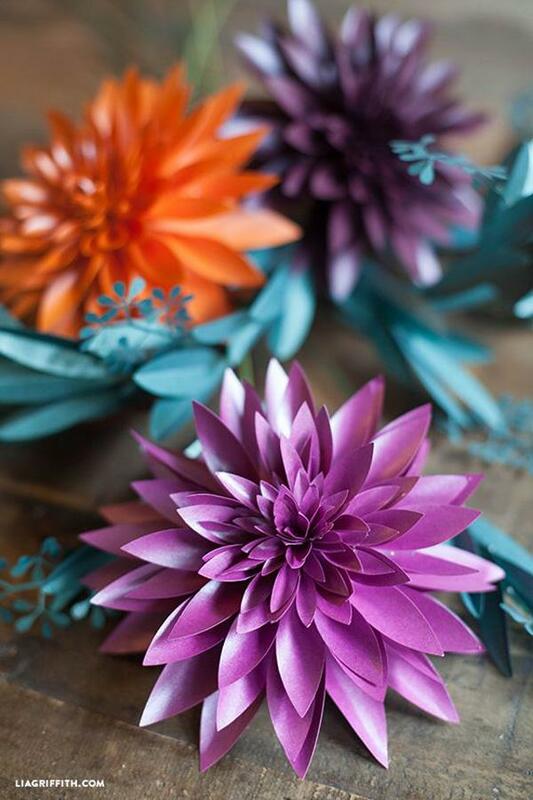 The progress of paper production made origami widespread and affordable, while skills and forms of paper folding developed, making it a very special form of art. The first written instructions for making items out of paper date back to the late seventeen-hundreds, tracing to the famous “secret to folding one thousand cranes” book, or Senbazuru Orikata, by Akisato Rito. 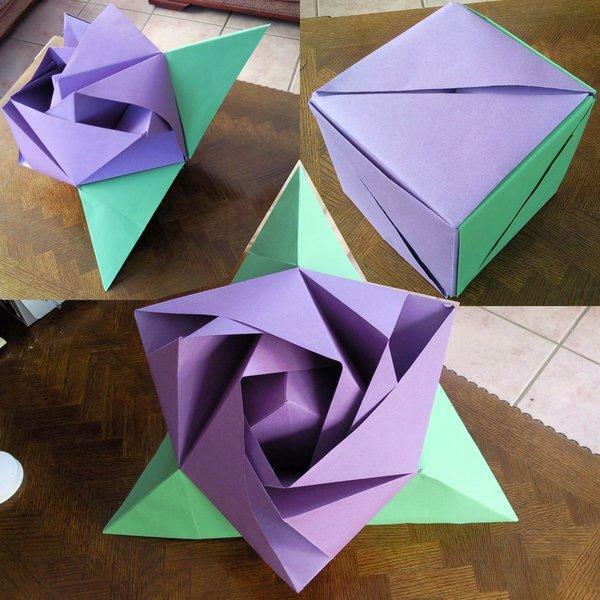 In the mid eighteen-hundreds, Adachi Kazuyuki teamed up with Kaya Ragusa and issues a more elaborate textbook in origami. The end of the 19th century was marked with the appearance of the name for this noble art as we know it today, switching from “orikata” to origami. Paper folding art was not indigenous to Japan alone, but it had appeared in Europe as well. When the Moors entered Spain, they brought this skill with them, it spread across the Pyrenean peninsula and then across the whole of Western Europe, becoming common in the 19th century. 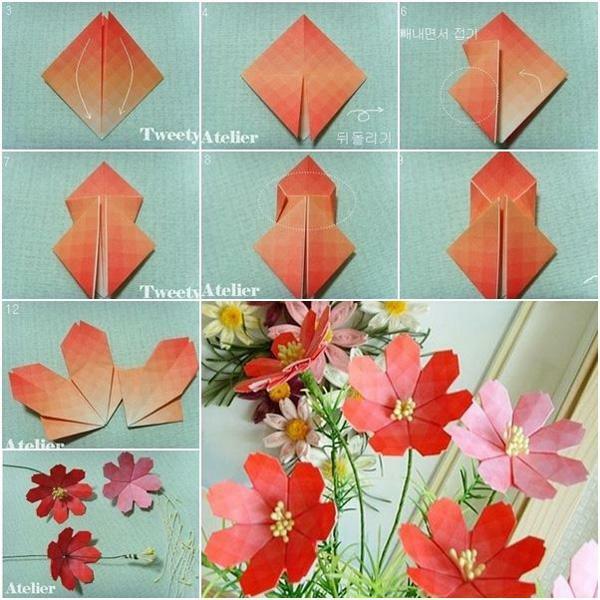 Still, Japanese style origami maintained its special form, meaning and charm. 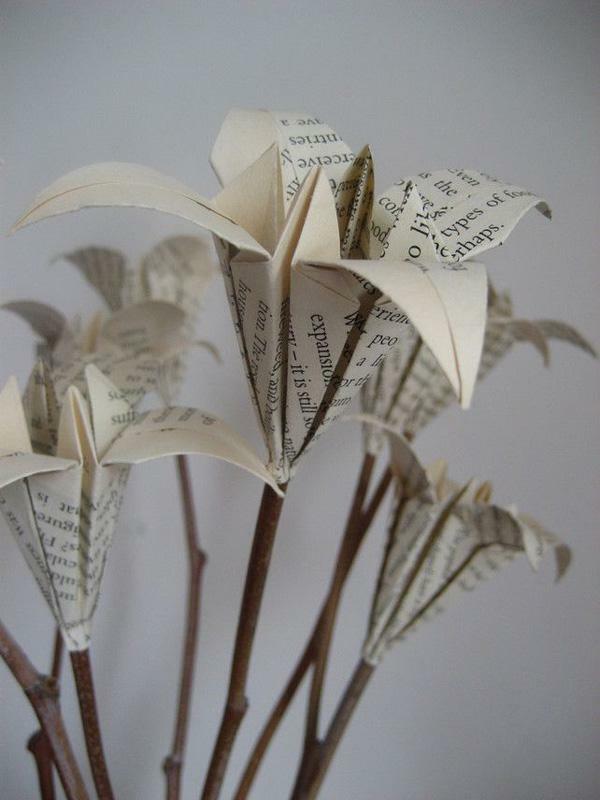 While traditional origami was passed down through generations orally, modern origami is generally recorded in books, often developed and reinvented by contemporary designers. A lot of origami models we find today are under somebody’s copyright, but this doesn’t go for the oldest forms, such as the aforementioned crane. While modern origami praises the skill of folding paper without the use of cuts or glue, traditional origami, especially that kind bound to other countries than Japan, does not exclude these aids. 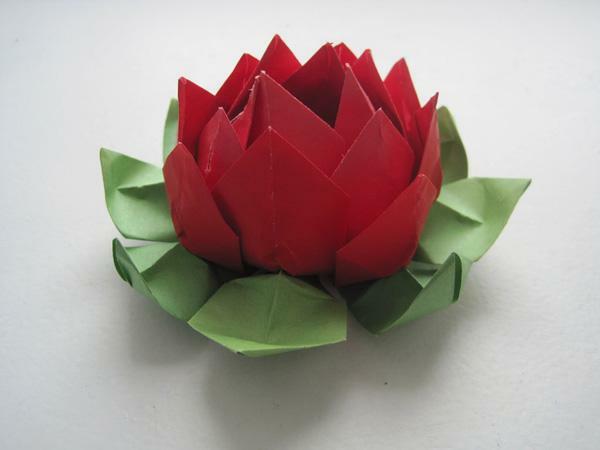 One of the fathers of modern origami was Akira Yoshizawa. He passed away in 2005 at the age of 94, after having developed a special folding system back in the 1930s, helping global origami standardization. 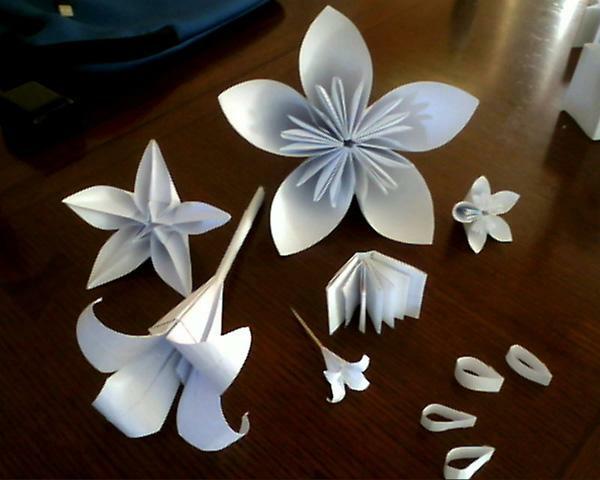 Today origami permeates the area of hobby, design, art and even mathematical calculation. It serves multiple purposes, always bringing the folder a lot of satisfaction. 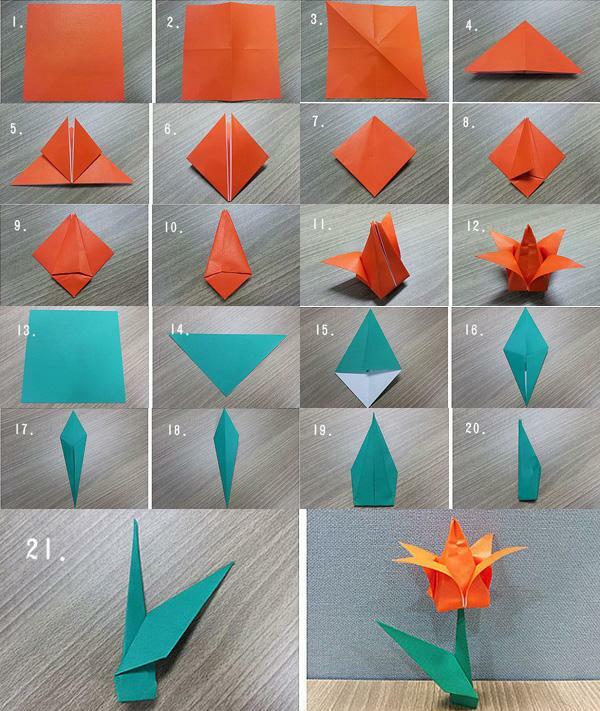 Known origami techniques are usually based on several basic shapes or models, such as valley or mountain, pleat, reverse fold, squash fold, sing, square base, fish base, waterbomb and the frog base. A lot of tools is used – bone folders, tweezers, rulers, even glue and scissors. And finally, the types are many – from kinetic origami, to modular, wet-folded, to kirigami – art of paper cutting. 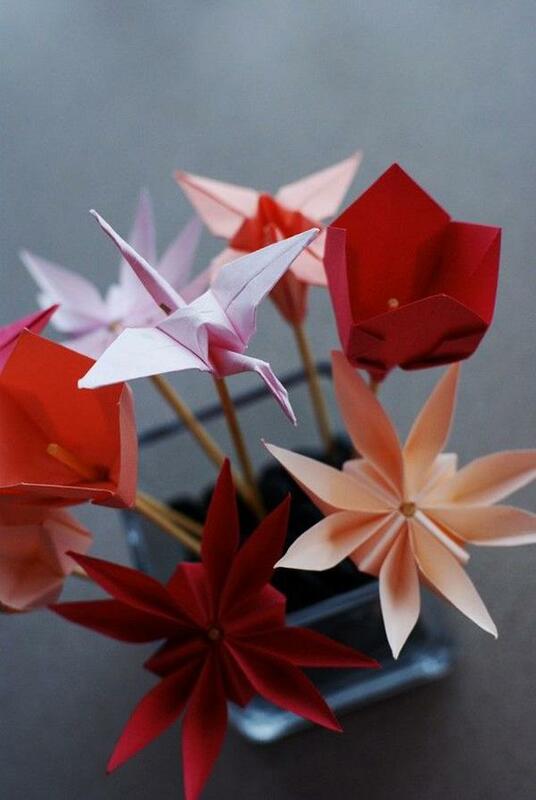 One of the most touching origami stories is the one of Sadako, a young girl from Hiroshima. The legend says anyone who creates one thousand paper cranes will have their biggest wish come true. Sadako Sasaki was a survivor of the atomic bombing at the age of two, and in 1955 she was suffering from leukemia. Knowing she was very sick, even though she was only a girl, Sadako hoped to make the cranes to restore her health. Having seen other children passing from the same disease, she understood her end is approaching and instead of her health – she wished for world peace and that children in the world will no longer suffer. She died after having made 644 cranes, but her classmates finished her legacy and buried Sadako with a wreath of 1,000 cranes to honor her. Since then, a paper crane and the name of Sadako Sasaki became an international symbol of peace, while the city of Hiroshima hosts a statue of the girl releasing a paper crane into the world. A group of thousand cranes is called Senbazuru in Japanese, and every year her statue is adorned with heaps of charming origami birds. 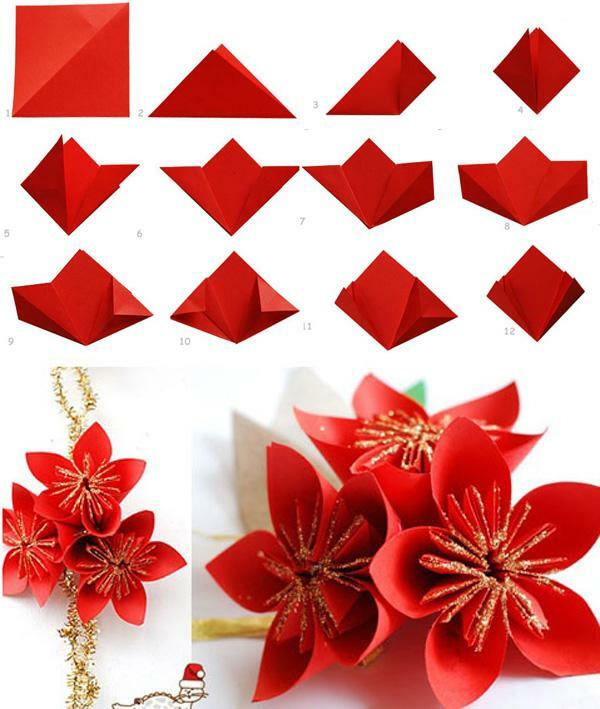 Origami is also an excellent decoration, gift wrap or a gift itself. 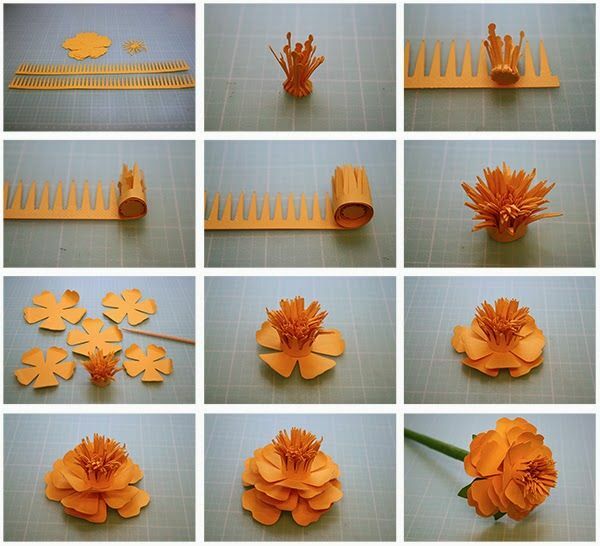 This article gives a selection of origami flowers and various solutions to fold them. 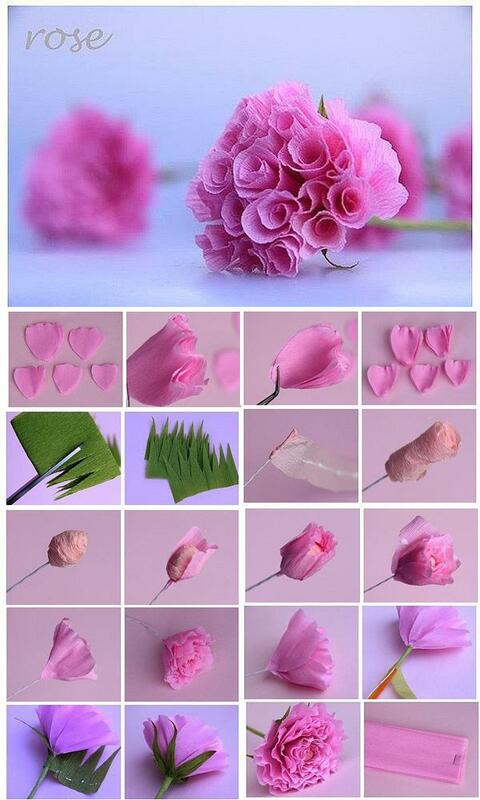 First, you will need to cut out the portions of the flower – the comb-like inner part, pistil and stamens, petals. 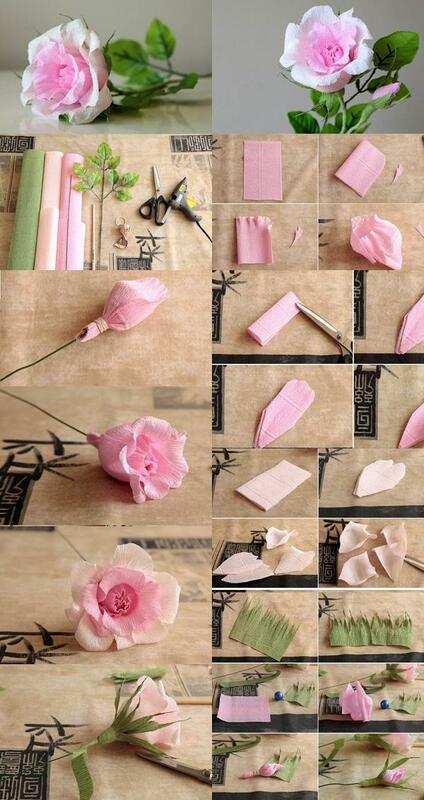 Then, starting from the inside, you can roll the inner part of the flower and glue it together. 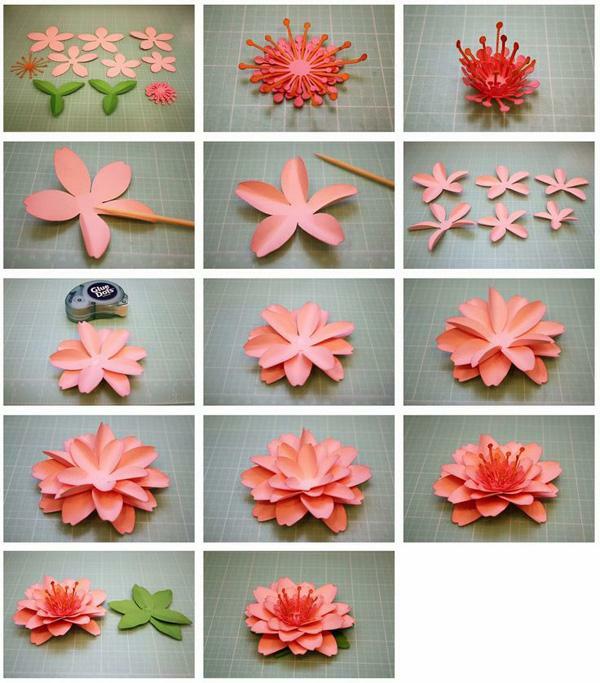 Then add petals on the bottom, one by one, making the origami flower rich. At the end, attach to the paper or plastic stem. Starting from a square base, divide it into four squares.Then fold it by diagonal, and make a three-dimensional shape like in the picture. Fold the paper over the diagonal, and then fold the sides towards the center. Wrap the sides (little wings) towards the center like in the picture, and press them together.Open up your two sides on the bottom and allow the paper ends to start detaching. 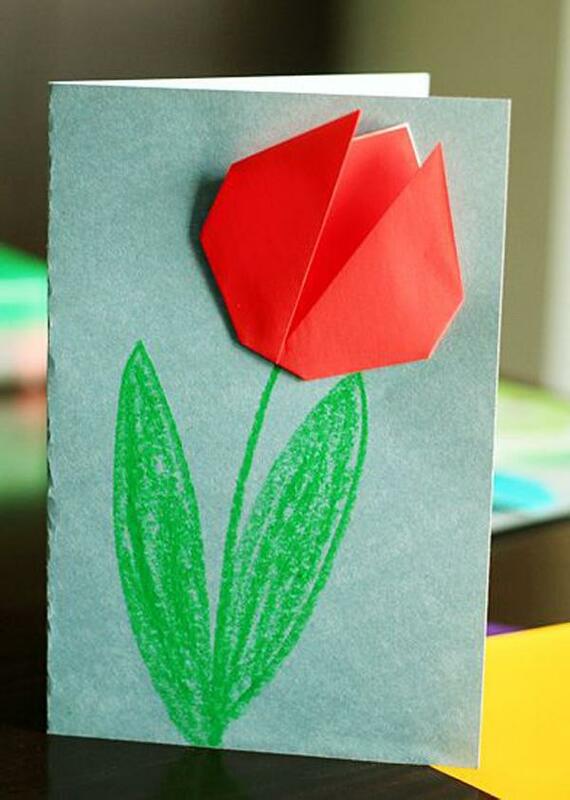 Then fold them out, making a lovely origami tulip! 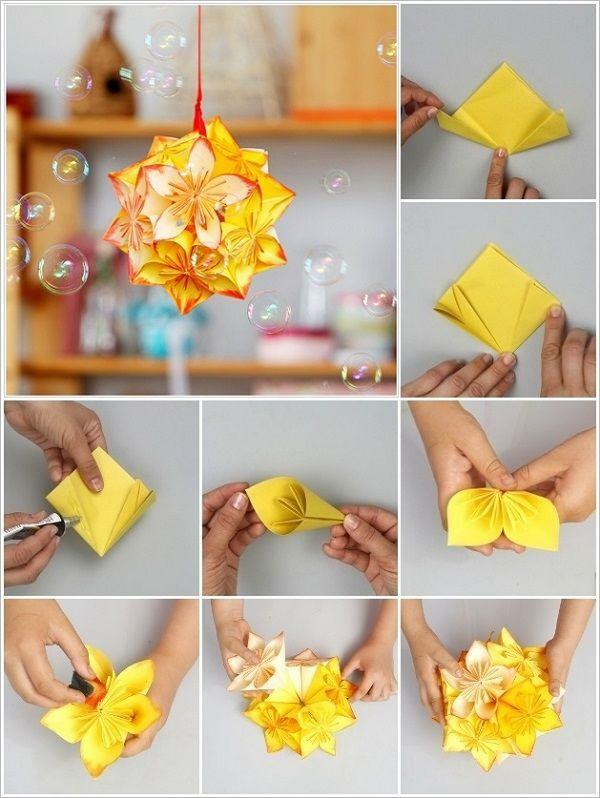 Origami can be made of tissue paper too! Just select a multi-layered paper napkin.Fold it in zig-zag, keeping the length and round the ends with scissors. 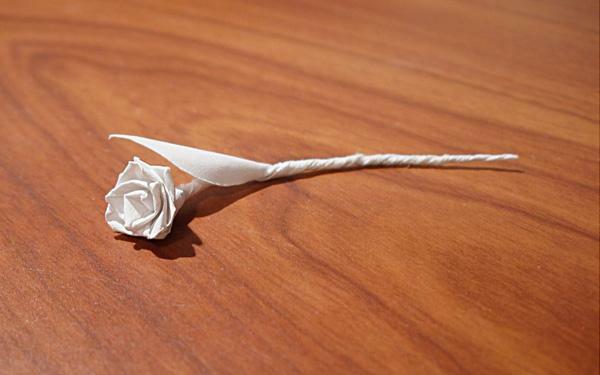 Fold it back into one tight line, tie it firmly at the center and start splitting the “petals” from the center. The more layers your tissue had, the richer your fairy ball will be. 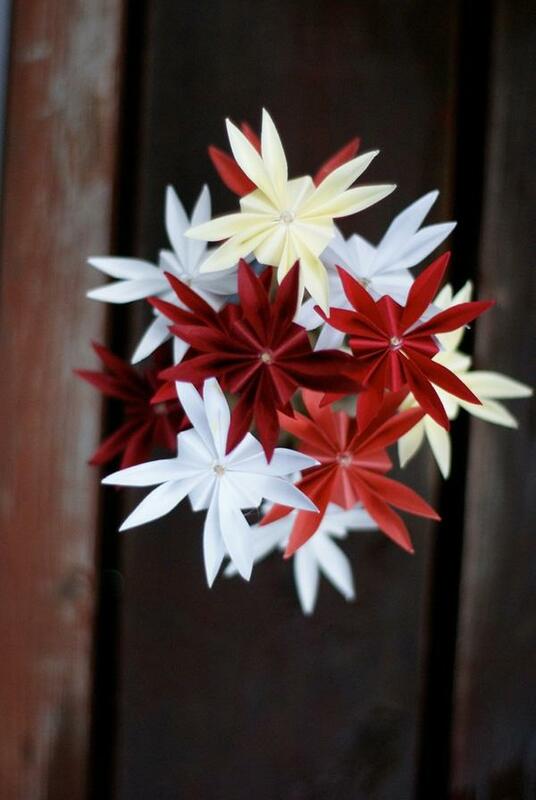 This paper decoration can be used as a party or holiday decor! 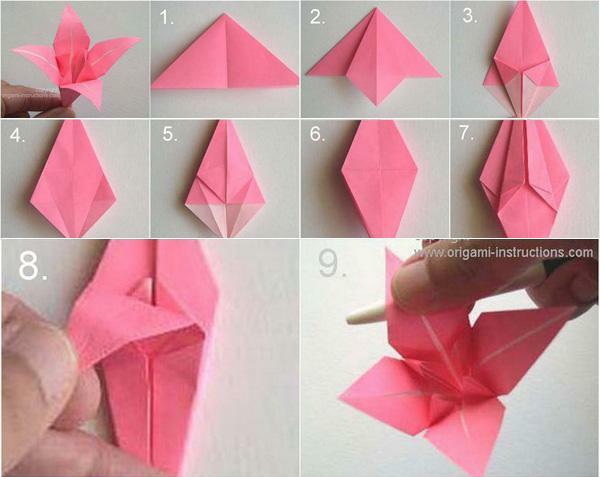 Make an origami tulip like in the picture above. 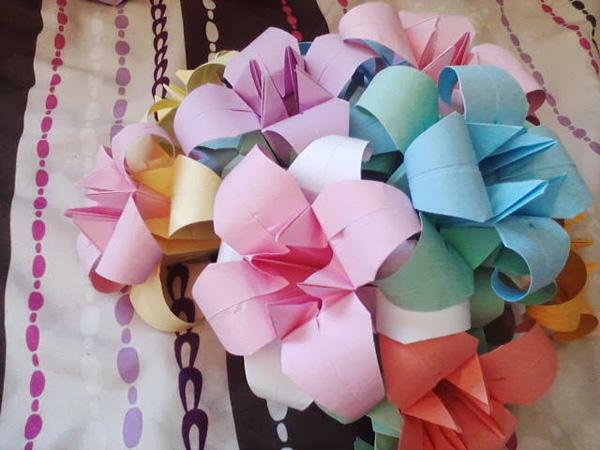 You can select different colors of paper and make a bunch! 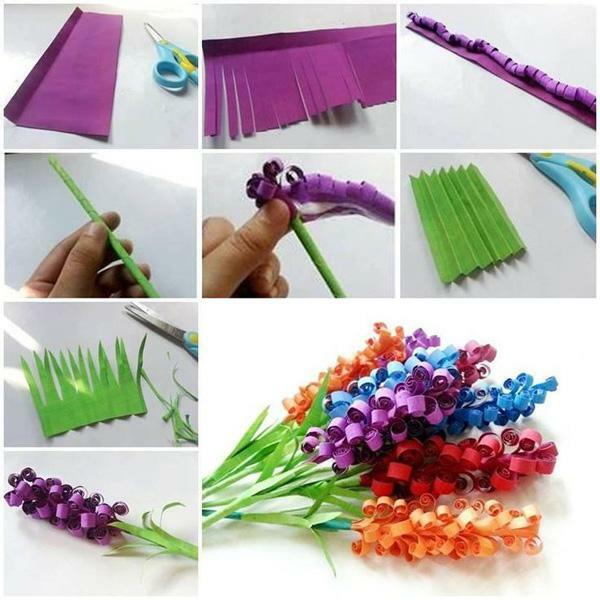 Then go on and make a complete origami stem.You will need a square green paper, and in seven easy step (14 – 20), you will have a paper stem for the origami flower. 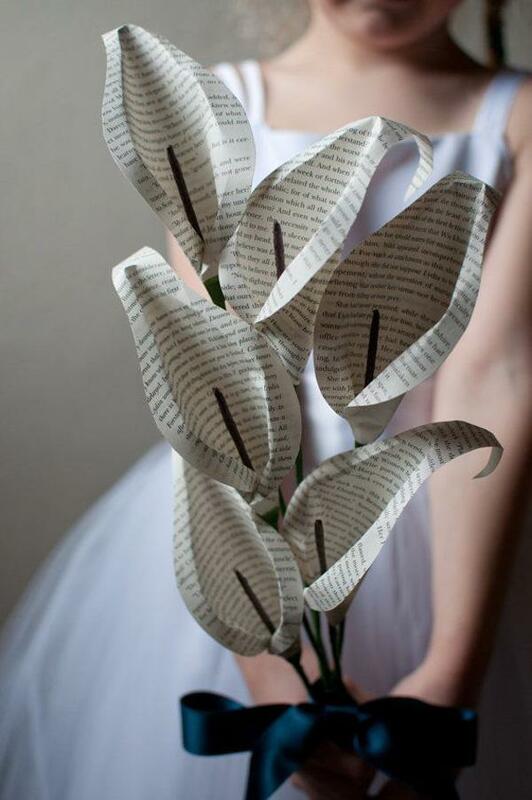 Roses are very gentle, and they should stay such, even when made out of paper. This rose is made with layers of thin tissue paper. First cut out many petals out of many layers of tissue paper. Select a nice shade for the roses, but you can play with multiple too. 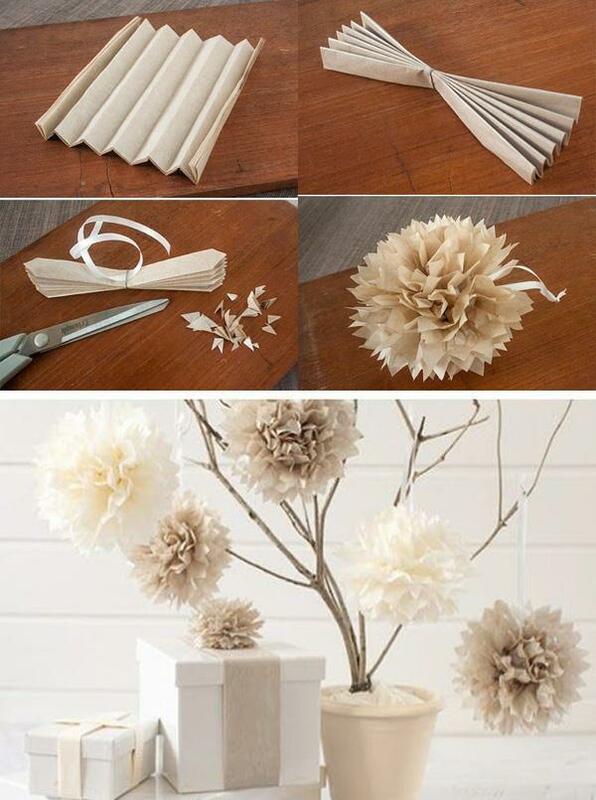 Then, to a stem of paper or wood, start applying adhesive paper tape, making the flower center. When you get a small ball, glue petals one by one to the center carefully. In the end, add small green leaves. 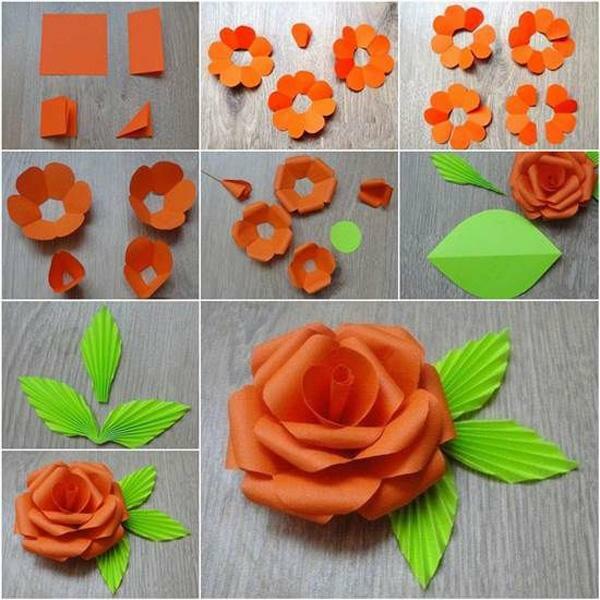 A bunch of paper roses can be a great spring decoration. 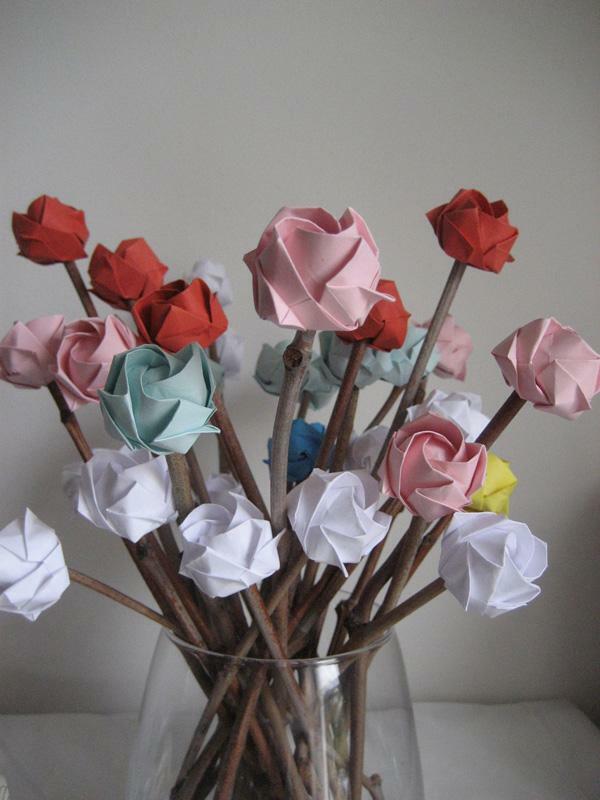 Roses can be made, similarly to tulips, out of the hard folding origami paper. 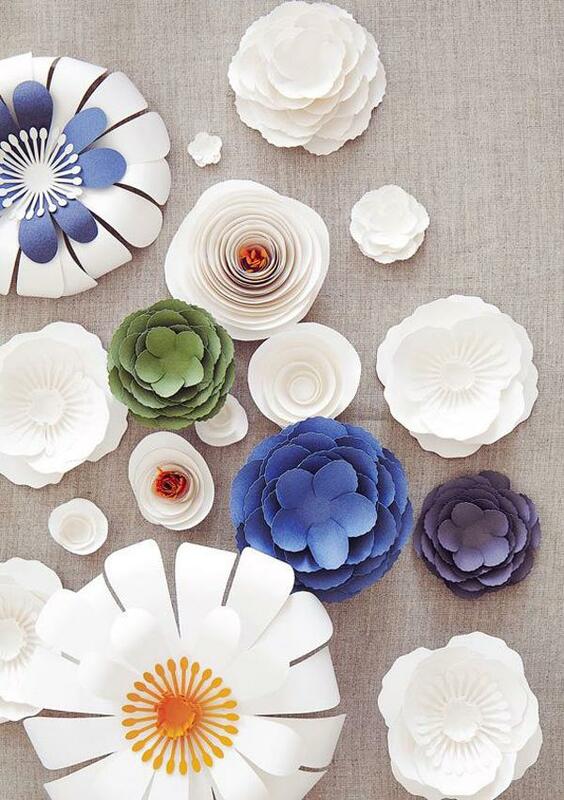 You can choose patterned paper, also with flowers on it already, and make your paper flowers more visually interesting! 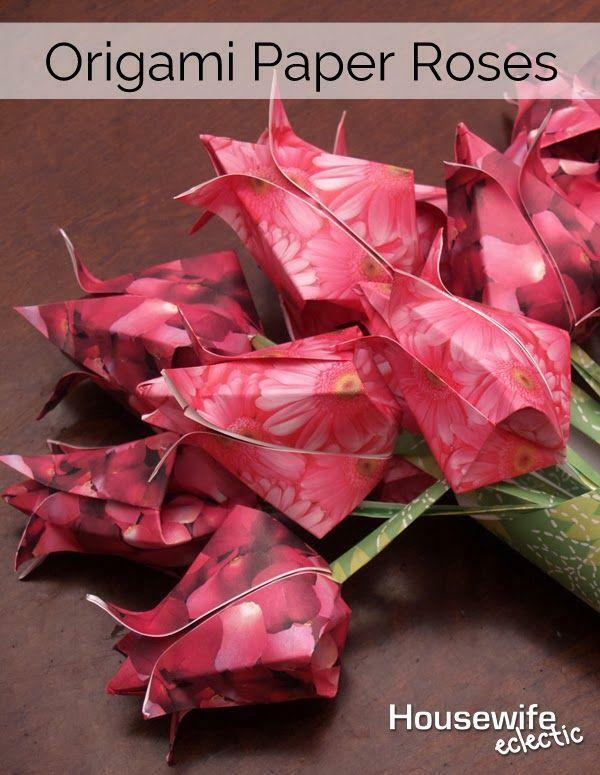 Making an origami lily is a bit more complicated than making a tulip, but the result is excellent. 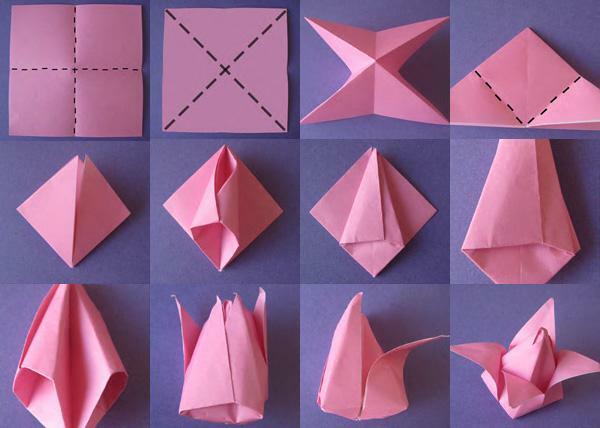 Once you master this, you can make a bunch out of differently colored origami paper sheets. 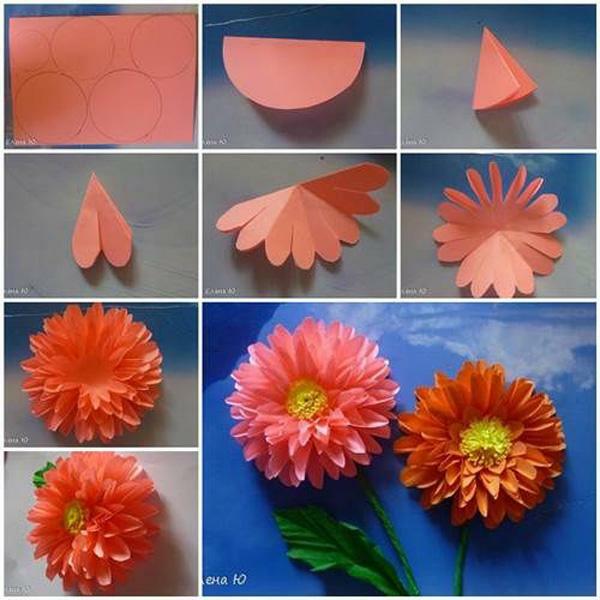 Chrysanthemum is a beautiful flower and it can also be recreated in origami, or rather – kirigami. Cut out layers of chrysanthemum petal groups, slightly increasing in size. There should be at least 12 layers, then glue them all together, and perhaps even fasten with a pin in the center. The result will be stunning. Peony is a lighter flower, so it’s best made out of tissue paper – similarly to the Fairy Ball. The difference is – make the ends pointy and not rounded. You can play with colors or keep it simple and monochrome – depending on what you wish to achieve. 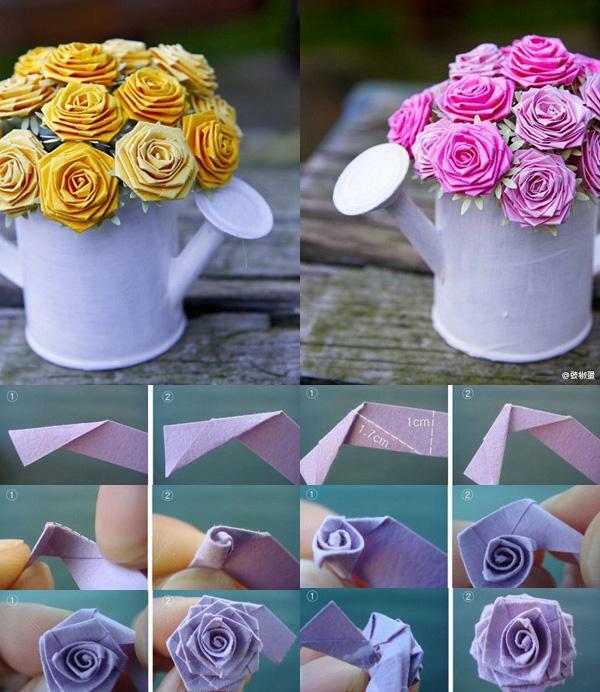 Origami fans are easy to make, but the choice of paper makes them visually beautiful. 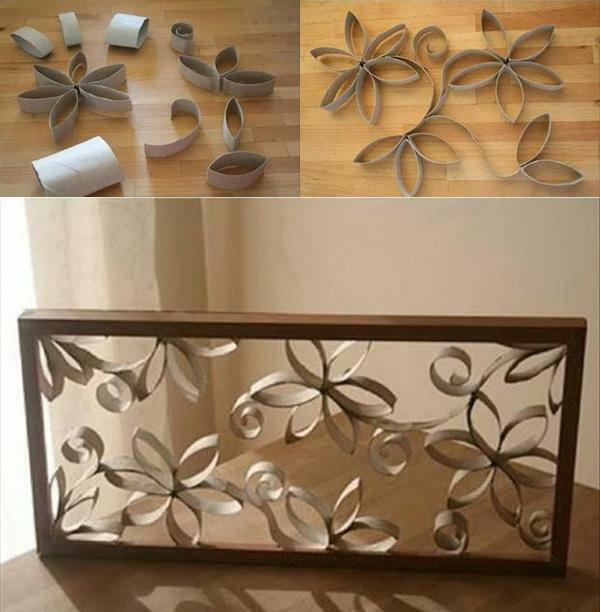 You can make a thematic Japanese wall in your home by making a number of fans in different sizes and attaching them one over the other. To stick to the topic, select a gentle, pastel palette of your paper, or with some Japanese prints, such as cherry blossoms or dainty branches. Have fun! 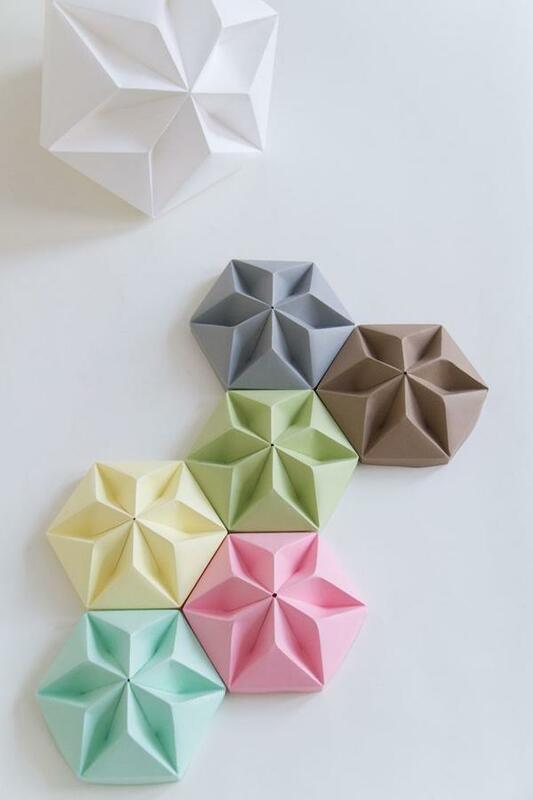 What is the name of the origami pattern above that looks like little pastel mints? It is very pretty and I am interested in learning that design. 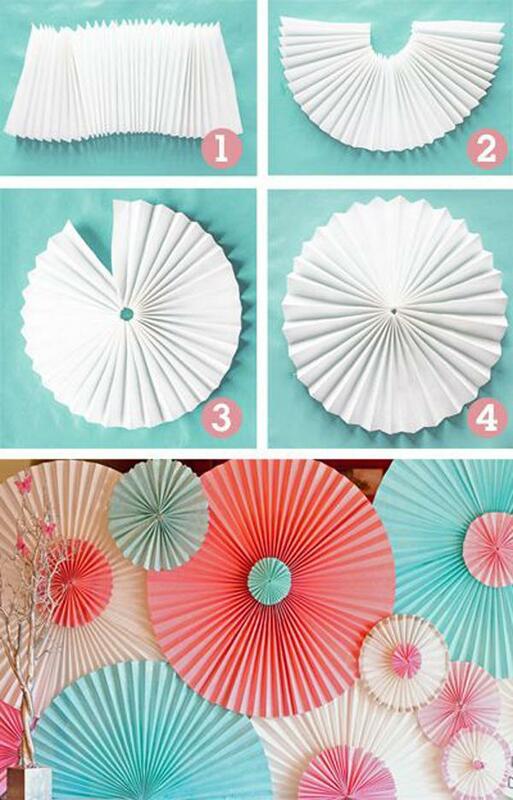 It’s called as ‘origami ceiling roses’. 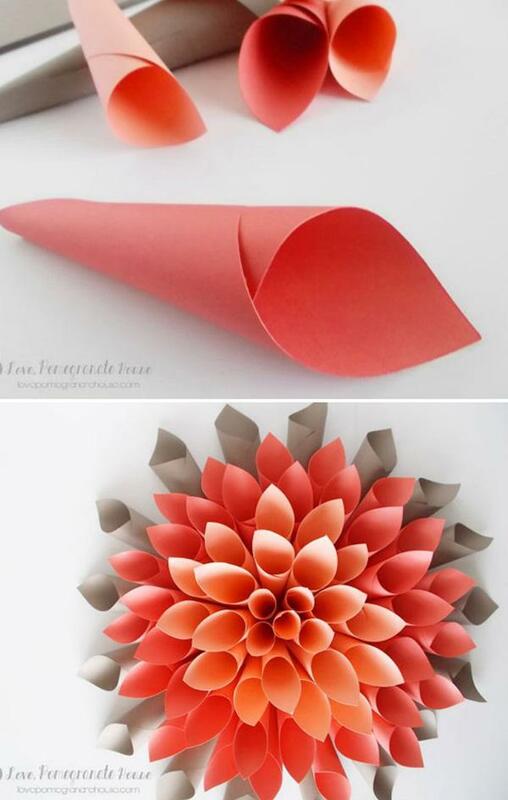 Origami ceiling rose… I have looked everywhere for instructions for these and can’t find any and obviously this website has no idea either. Can you recommend any website that does? I was wondering where I can find the template for the purple and orange flowers theres about 16 petals and they come to a point. I love the lavender & green box-like flower about in the middle of the 40. How do I get directions to make it? Thanks! 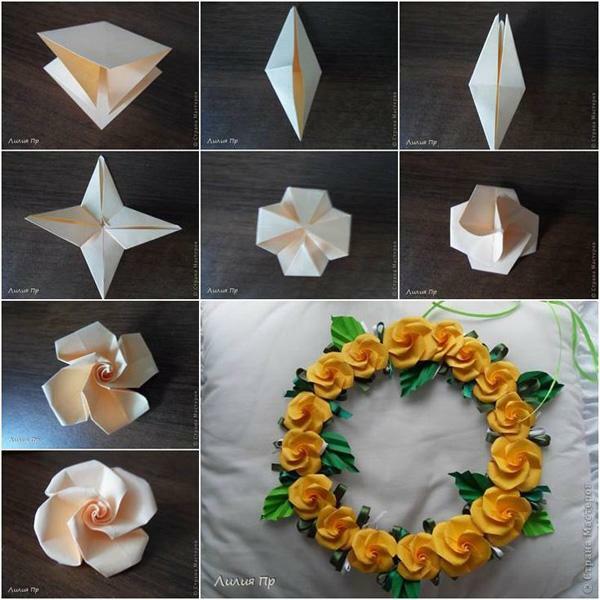 Origami art is good l want to learn origami paper art your contact number is not written here please written your contact no.